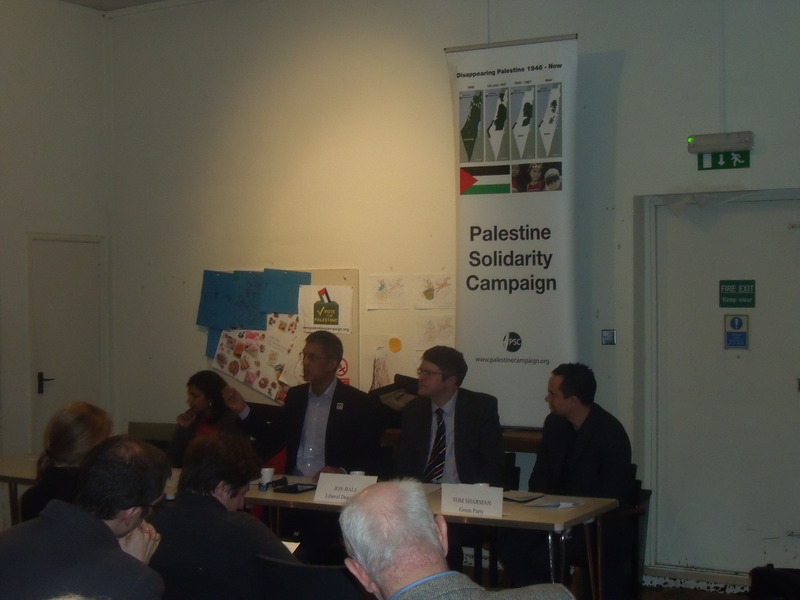 Conservative MP Angie Bray empty chairs despicable Palestine Solidarity Campaign event. Rupa Huq (Lab. ), Salim Alam, Jon Ball (LibDem), Tom Sharman (Green) last night. Angie Bray, Conservative MP for Ealing Central & Acton, refused to attend last night’s West London PSC event Palestine is Still the Issue. The event was held at St Mary’s Church, Ealing and was hosted by Salim Alam, chair of West London PSC. The rather unpleasant Mr Alam once threatened to knock a camera I was holding out of my hands. The remaining panelists were three challengers for Angie Bray’s Ealing Central & Acton seat at the upcoming general election this May: Rupa Huq (Labour), Jon Ball (Lib Dem. ), Tom Sharman (Green). Huq, Ball and Sharman were all anti-Israel automatons. Their party leaders would have been proud. All three were ready to confine Israelis to hell just as long as they won themselves some votes last night. Sharman wanted Britain to stop supplying weapons to Israel and to stop buying weapons from Israel. He said “Israeli weapons are road tested on the Palestinians and so they are attractive to the British government”. Ball started off by saying he wasn’t an expert on the Israeli-Palestinian issue but then went on to call for a boycott of “settlement” goods and for “ending the arms trade with Israel”. He did, however, reject economic sanctions against the whole of Israel but not on the ground that such action was wrong but on the ground that it would only “fuel the collective paranoia of the Israeli government and its supporters overseas” and make them more hardline and right-wing. Huq, meanwhile, was obsessed with Ed Miliband being Jewish. It was something she repeatedly mentioned without explaining the relevance. Her second main obsession was that Israel is, apparently, starving the Palestinians of water (see clip below). She said “they’re basically shutting off the water supply to the Palestinians”. Lies and utter nonsense from a woman who attended Cambridge University. During the Q&A an elderly woman quoted Albert Einstein in the 1930s about making peace with the Arab communities. She then said she was saddened that “the Jews are not smart enough to understand this”. It would have been the decent thing for Huq, Ball and Sharman to have called her out on her anti-Semitism but maybe they were worried that might cost them votes. Finally, Alam announced that UKIP had not been invited to speak at the event because they were the antithesis of what the PSC stood for. That’s ironic because PSC events are some of the most racist and anti-Jewish one could attend being on a par with those held by far right extremists. For example, I once attended another event chaired by Alam also in a church. Afterwards I recorded one of that event’s attendees mocking the way Jews died in the Holocaust. The sickening statement released afterwards by the West London PSC said that she had been “harangued”. And one of the guest speakers that night was the Reverend Stephen Sizer who recently posted a link to his Facebook suggesting Israel was behind 9/11. So while Huq, Sharman and Ball all lowered themselves by contributing to yet another sickening PSC hatefest Angie Bray’s refusal to attend was the only dignified response.